The Hortus botanicus of Leiden is the oldest botanical garden of the Netherlands, and one of the oldest in the world. It is located in the southwestern part of the historical centre of the city, between the Academy building and the Leiden Observatory. In 1587 the young University of Leiden requested the burgomasters of Leiden permission to establish a hortus academicus behind the Academy building, for the benefit of the medicine students. Permission was granted in 1590, and as prefect was appointed the famous botanist Carolus Clusius (1526–1609), who arrived in Leiden in 1593. Clusius' knowledge, reputation and international contacts allowed him to set up a very extensive plant collection. Clusius also urged the Dutch East India Company (VOC) to collect plants and (dried) plant specimens. The original garden set up by Clusius was small (about 35 by 40 meters), but contained more than 1000 different plants. The collecting of tropical (from the Indies) and sub-tropical (from the Cape Colony) plants was continued under Clusius' successors. Especially Herman Boerhaave (1668–1738, prefect from 1709–1730), contributed greatly to the fame of the Hortus with his efforts to collect new plants and specimens, and with his publications, such as a catalog of the plants then to be found in the Hortus. Another major contribution to the collections was made by Philipp Franz von Siebold, a German physician who was employed on Deshima (Japan) by the VOC from 1823 until his expulsion by Japan in 1829. During that period he collected many dried and living plants from all over Japan (as well as animals, ethnographical objects, maps, etc. ), and sent them to Leiden. The first greenhouses appeared in the Hortus in the second half of the 17th century, the monumental Orangery was built between 1740 and 1744. From its original plan the Hortus was expanded in 1736 by Adriaan van Royen and Carl Linnaeus, and in 1817 by Theodor Friedrich Ludwig Nees von Esenbeck and Sebald Justinus Brugmans. In 1857, a part was used for building the new Leiden Observatory. From a historical perspective, the old Golden Chain (Laburnum anagyroides), planted in 1601, the Tuliptree (Liriodendron tulipifera) from 1682 and the Ginkgo (Ginkgo biloba) from 1785 are worth mentioning. The greenhouses with Victoria amazonica and other tropical plants, and the large collection of sub-tropical plants in the recently renovated Orangery and the new Winter Garden draw many visitors. The park itself is an oasis inside the old city, with many more interesting plants and trees. A Japanese garden in honour of Von Siebold opened in 1990. A reconstruction of Clusius' original garden, based on a plant list dating from the end of the 16th century, was opened in 2009. 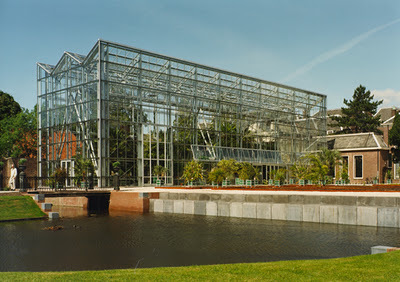 From a scientific point of view, the Leiden Hortus is known for its collections of Asian Araceae (among which the Amorphophallus titanum), Hoya, Dischidia, Nepenthes, Ferns and one of the biggest collections of Asian Orchids in the world.